I wanted to start a thread on hybridizing goals but thought it might be good to do a lead-in thread first on species & hybrid classification so the terms used are clear. For this thread we are focusing on the genus Lilium and the species classified under this genus. There are a few genera closely affiliated with Lilium (Nomocharis, Notholirion, & Cardiocrinum) in the Liliaceae family that have been grouped with Lilium by different authors at different times but are excluded from my comments here. There are around 100 to 120 different Lilium species currently recognized and they are found primarily in the Northern Hemisphere. The definition of species can be very complicated and there are several schools of thought with respect to defining species (“Lumpers” tend to lump or group things into fewer broader species & “Splitters” tend to look at smaller variations and consider that as criteria to split things into smaller groups = more species). The definition I prefer to use for species is “a wild population of plants that resemble one another in certain key characteristics and can reproduce by seed resulting in seedlings that fall within the normal variation of the wild population and are stable over several generations.” If two wild populations can’t produce seed when crossed that would be a key indicator they are different species. There are a few naturally occurring hybrids but very few are reported in Lilium. H. F. Comber published in the Royal Horticultural Society “The Lily Yearbook 1949” a proposed grouping of individual species into 7 different sections based on a number of criteria. Those criteria were - Germination (IE-IH-DE-DH), Leaf arrangement (whorled-scattered), Bulb scale (jointed-entire), Seeds (heavy-light), Bulb shape and habit (erect - sub-rhizomatous – rhizomatous – stoloniferous), Perianth segments (papillose-smooth), Nectary (pubescent-glabrous) , Flower shape (turk's cap-trumpet), Bulb color (white-purple), Stem habit (erect- stoloniform), Petiole (obvious - obscure or absent), Stigma (large-small), Stem roots (present-absent), Stems per bulb (one-sometimes two). This grouping was an improvement over the previous attempts to group all the lily species based on flower form alone. Regardless of how you group the species, it is wise to consider each one with its own special requirements as many have adapted to very specific microclimates and require special growing conditions. Some species can be very adaptable and long lived while others require exacting growing conditions to survive and even then require regular replenishment by growing new from seed. It is important to understand the soil, moisture, temperature, light, and nutrient requirements for the species you are considering growing as these can make or break your attempts with a certain species. If you can find someone growing the species you are interested in, it is great to ask them how they grow it and what their recommendations are. For me, the species that is my white whale, great white buffalo, unicorn, or Holy Grail is Lilium speciosum var. gloriosoides from China. I have grown it for a very short time (familiar story for those who have tried) from wild collected bulbs and trying again now to grow it from seed. In this particular species, I have not found someone able to grow it for more than a few years without losing it – the closest I have heard of success was from Rod Barwick in Tasmania. In this case I believe the biggest challenge for us to learn how to grow it is the fact that it is listed as a subspecies of L. speciosum from Japan and we assume it requires similar growing conditions. In my opinion, the L. speciosum var. gloriosoides from China is a fully separate species from those in Japan and also a separate species from the form found in Taiwan. The reason I believe this is because 1) these forms do not make seed when crossed to each other, 2) they are in separate locations separated by sea, & 3) they have a physical differences in flower color/pattern & flower shape (haven’t seen them side by side to compare other attributes). I recently found there to be a large number of pictures that people have posted on Facebook of the Taiwan form and a few pictures of the China form which has further convinced me these are all separate species. I look forward to someone doing a formal evaluation of these species and would love to hear from anyone having success in growing the China form as there is very little information available on the growing conditions in the wild for the China form. VIII)	Interdivisional Hybrids including LA’s, OT’s, OA’s, & LO’s. There are different preferences when it comes to species and hybrids. Some folks only grow species and have absolutely no interest in hybrids while others grow only hybrids but most people fall somewhere in the middle and choose to grow a mix of both. The beauty of the species is undeniable as is the challenge to grow some of them in each of our unique climates that often don’t match up well with some of the species native habitat. In general hybrids can be easier to grow. There are several advantages hybrids can have over species including hybrid vigor & greater adaptability to a wider range of growing conditions. Through hybridization new attributes not found in species can be achieved including new flower shapes/sizes, new flower colors & patterns, larger and smaller plant size, and greater durability. A hybrid combines the attributes of both parent plants into a new plant and each parent plant often has strengths and weaknesses. The hope of hybridizers is to maximize the best qualities of both parents and minimize the undesirable qualities. For instance, a hybridizer could choose to cross a pink flowered lily with a weak stem with an orange flowered lily with a strong stem in hopes of getting a pink flowered lily with a strong stem. The challenge is that you may also end up with an orange flowered lily with a weak stem. My point in mentioning this here is to ensure it is clear that just because a plant is a hybrid does not ensure it is a better plant. There are some additional terms used in hybrids that would be useful to introduce here. When two lilies are crossed that are not of the same species or of the same genetic background, the first generation cross is referred to as the F1 generation. If siblings from the F1 generation are crossed the resulting seedlings are referred to as the F2 generation. If F2 siblings are crossed they produce the F3 generation and so on. This can be useful terminology when discussing multigenerational crosses. Another useful term is backcross - this is where an F1 seedling is crossed to one of its parents. Hopefully this information is helpful as we discuss further topics. Looks like I messed up and didn't get a title put in for this and it doesn't look like it will let me edit it. If a moderator could help - could you please add the title "Lilies species & hybrids"? Thanks for the help in fixing my forgotten title! I've linked to my Google Drawing, as I update it from time to time as I learn more. 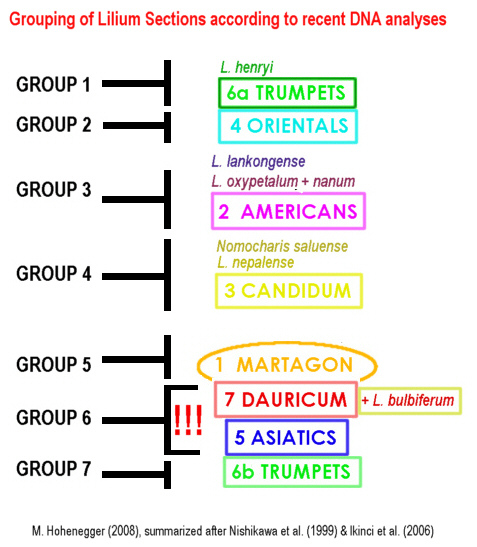 Update #1: Revised to include hybrid combinations such as Martams, Martasians and other Longiflorum hybrids. Update #3: Revised to include other combinations such as Henryi-Candidum. Thanks Australis for sharing your diagram - for me it is always helpful to see a picture! A few others that you could add if you update your picture are Longiflorum x American (Fusion & others), Longiflorum x L. candidum, Longiflorum x L. henryi, Longiflorum x Div VI (Easter Dawn), & L. nepalense x Div VII (Kushi Maya & others). Due to advanced techniques it may be difficult to list all combinations before too long. Good stuff, I fall into the middle category of people who grow species and hybrids. I like the idea of crossing species that weren't worked with as much in the old days too. I agree about L. Speciosum var Gloriosoides. They should just change it to L. gloriosoides. It is magnificent. I also think that they should realign the groups for reasons you stated. Glad it was useful, Patrick. I have revised and updated it based on your comments (and updated the link in my post). Australis said: Glad it was useful, Patrick. I have revised and updated it based on your comments (and updated the link in my post). Thanks Australis! Couple more that came to mind as I read through your document. Candidum (June Fragrance) x Asiatic - ('Limerick' & 'Uprising') & L. auratum (oriental) x L .henryi [also reciprocal cross] For the latter examples would be '82111' & 'Tall Boy'. Challenge accepted - managed to squeeze those combinations in as well. It's getting a little crowded at this stage! I have a bit of an interest in species crosses outside of the typical intradivisional hybrids, especially where the crosses can be achieved by normal means (for example, I know L. bulbiferum - which I think belongs in Sinomartagon - can be crossed with some of the Candidum section). I hope some day to be able to experiment a bit with this, but that day is quite a few years away yet - need to grow the species I want first to maturity first! I'd also be interested to know if any hybrids have been created using the species in the Lophophorum or Nepalensia sections on my diagram (apart from L. nepalense). I would have thought L. primulinum would have been a candidate? Thanks Australis for the additional update - well done. You can download the PDF for free - the fee listed is if you want a printed copy. By the way, it looks like they just published the 2017 5th supplement - it is the first time I have seen it. Thanks Patrick. I check the register every so often and the 5th supplement is definitely new. Glad they've finally updated it - have been waiting on that for a while. Australis - a few more wide crosses for you. Longiflorum x henryi, henryi x candidum, longiflorum x martagon. These are on the liliumbreeding.eu web site. I'd be interested to know what a Longiflorum X Martagon hybrid looked like. If that leads to more resilient, vigourous martagon-like hybrids, that will definitely be interesting. Well, that was certainly a challenge, but managed to add those hybrid groups as well (with only a minor increase the size of the diagram and only three line crossings). I'm counting L. longiflorum X L. henryi as simply a subset of Division V X Division VI, since if that crossing is possible, then the latter should be possible as well. Thanks Patrick. I've enjoyed trying to display them all on the diagram. I expect that at some point I may have to add a "catch-all" interdivisional group for all the more complicated crosses. These are from liliumbreeding.eu, back in 2008; and I'm sure they had already been published for quite some years. Henryi x candidum had already been done. Thanks Rick. Saw those when I had a look at the link in the last few days. It's just not a cross I would have thought of. I wonder what the aim was with the HC and LHC breeding? Australis said: Thanks Rick. Saw those when I had a look at the link in the last few days. It's just not a cross I would have thought of. I wonder what the aim was with the HC and LHC breeding? Josh - there is a report that talks about why they chose certain species based on different attributes. I found this to be a useful comparison of attributes of different species for hybridization strategy. There is a strong bias toward cut flower breeding in the evaluation of the different attributes from each species. Thanks for the link, Patrick. I think I've stumbled across that paper before but hadn't read it in detail. Looking at the list of characteristics now, I can see why they would attempt henryi X candidum - trying to preserve the vigour and virus resistance of L. henryi with the bloom characteristics and low temp, low light tolerance of L. candidum. I agree that most research is driven by the cut flower industry, but hopefully us gardeners can still benefit from it.